For starters, I began my kombucha process about a week and a half later than the original start date. 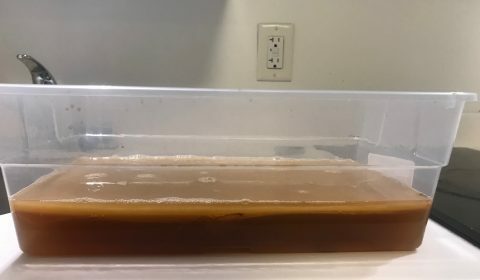 I followed the instructions from the files and the one we got from the material library – boil water for tea, and add sugar, then just drop the scoby in. I wasn’t sure exactly how much sugar because one set of instructions said all, while another had a different measurement. So I decided to compromise and do half of what was provided. From there, I just left the box in one of the empty drawers in my room. So it was in a dark secluded places for a good month and a half. I didn’t interact with it much at all besides take a peek here and there and a picture or two. As for the temperature, it was always fluctuating, based of the temperature outsides, along side my body temperature. As for the first initial week however, it was solely based on the adjusting room temperature based on the temperature outside, because that was the week of spring break. Which if I remember correctly, it was pretty cold here in the city. 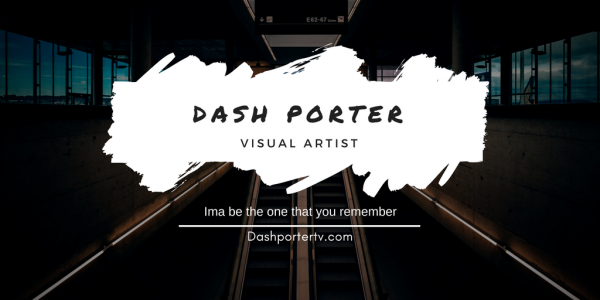 I was out of state, so I truly don’t remember. Being that it is was in a drawer, I believe it was somewhat in a warmer space as compared to just sitting outside on my desk. Once I came back, up until I removed it from the box, it has felt temperature anywhere from 55-79 degrees. I don’t know what effects it caused, but I assumed it did have some sort of effect, due to the fact that all the instructions said to set it in room temperature. From the very few times I interacted with the growth, I know it went through a lot. Originally, when I first placed the scoby in the tea, it looked normal. 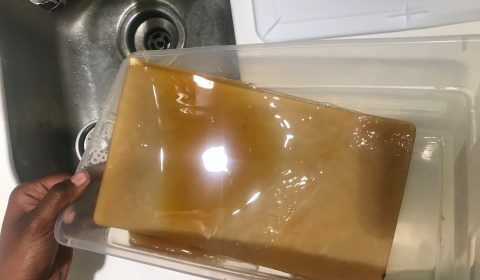 The scoby, white, and the tea, kinda translucent brown. 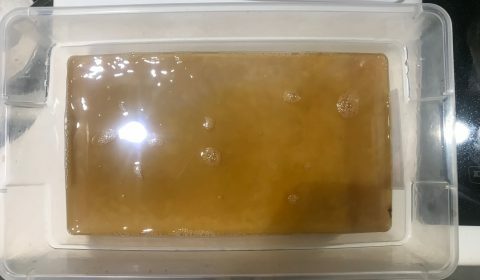 The week after my return from spring break, the kombucha changes. It was a foggy brown, with string like pieces floating around. The scoby had seem to flatten, as compared to when I first took it out the packet, it was an elliptical shape. Two weeks later, it was still foggy brown, but a lot of white areas where visible. Which I assumed was mold, and double check with my professor for validation. After that, I honestly forgot I had the kombucha sitting in the drawer and it just sat there for three weeks unchecked on. 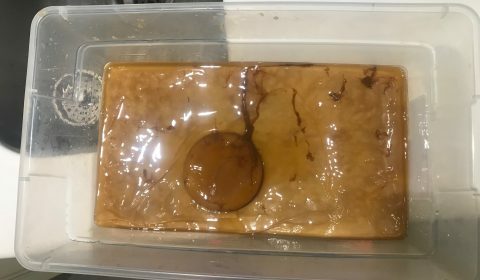 By the time I did remember and took it out, on the surface laid a flat thick paste, that was a tannish brown and on the other side attached to the thick paste was the scoby, no longer white, but the same color as the thick paste. Considering I started my process late, I also harvested late. So I got to see some dried pieces before removing mine. Based off my classmates results, I assumed it would look something along the lines of a thin layer of kombucha, cloudy light brow and have this certain feel. Which is not what happened to mine, as stated above.